Freezing and Food – Do They Go Well Together? One of the biggest problems we have with our food supply in the summer is that the heat makes storage of fresh meat almost impossible for any length of time because it spoils. In the winter, we don’t have that problem, but we do have a host of others. So, how do you keep food safely frozen in the winter, how do you store it, and what foods freeze well? We’re going to talk about that right now. Keep reading! First, if you’re in a survival situation and hoarding a food supply, you’re probably in fine shape as long as you’re in a place where you can store the food. As a matter of fact, your freezer that runs on electric is still a fine place to store meat without power as long as it’s outside and well below freezing out for most of the time. If it gets warmer than that consistently for more than a couple of hours per day, then you need to pack the freezer with snow or ice. That being said, if you keep the freezer closed after the temperature goes above freezing, it’ll keep everything frozen for another couple of days. Regarding ice, it stays frozen longer when it’s in large chunks, so use soda bottles or milk jugs, then pack them in your cooler. That way, you’re killing two birds with one stone – you have ice to keep your food frozen and you also have drinking water when it thaws out. Another way to keep food frozen if you don’t have an outside freezer is to pack it in the snow. This is kind of remedial and you run the chance of losing it to predators, but it’s better than nothing. 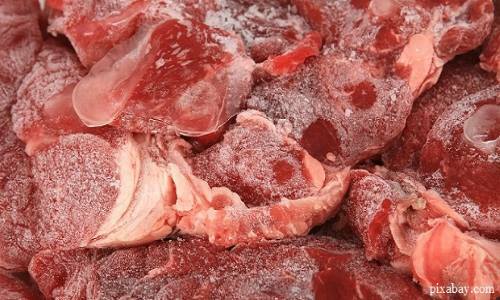 Just as your ice stays frozen longer when it’s in bigger chinks, so does our meat. Either cut it into large chunks when you butcher it, buy it in roasts, or pack all the smaller pieces into one larger bag so that it’ll freeze together. Don’t freeze it into chunks bigger than you and your family can eat in a couple of days so that you don’t waste it. If you have a place outside such as a storage building, you can improvise a cooler by building a cupboard, or even by hanging the meat whole in carcasses, covering it, so that the animals or bugs can’t get into it. That’ll work as long as the weather stays below freezing. Just as there are some foods that can well and some that don’t, there are also foods that freeze better than others. Meats, of course, freeze well, as do most vegetables and fruits. You can even freeze your jams and jellies as long as you don’t have them in sealed containers. Sour cream – most people say no, but I freeze mine all the time. The only thing I notice is that it separates a little bit, but I just stir it up and it’s fine. Sugar, as long as it’s in an airtight, moisture-tight container. If not, it will absorb moisture and turn into a giant sugar cube. Dried foods as long as they’re in airtight containers. These foods may freeze okay as part of a prepared dish such as a soup, but they don’t do so well raw. Mayonnaise, though only because it separates. You can always mix it back up. It may not be as pretty but it should taste fine. Now that we’ve discussed how well most food freezes, we need to talk about how to protect those foods that can’t be frozen. Of utmost importance are your canned goods. These are likely going to be staple items and if you lose them, you’ll likely go hungry. So how do you protect such foods? Well, the best answer is that you keep them inside. That sounds like a no-brainer, but you’d be surprised by how many people new to canning try to store their foods outside in the storage shed or other such places. Industrial-canned foods will burst, as will home-canned goods, though home-canned foods are more likely to blow the seal than actually explode. Either can happen though. Another great way – an idea way, actually – to store your canned goods in a way that will keep them from getting either too cold or too hot is to keep them in a basement or, even better, a cellar. Both maintain a fairly constant temperature, but if you’re going to use a basement, make sure that it’s heated a bit, but not so much that it’s above 70 degrees or so. Another real danger to your stockpile that’s secondary to freezing is moisture. When ice melts or when one side of a wall is cold and the other is hot, condensation can form that will run down onto shelves and soak your boxes, paper goods, and dried goods. Wet toilet paper sort of defeats the purpose and pasta that’s absorbed pantry-shelf water isn’t the best, either. To combat this problem, it’s always a good idea to store everything in airtight containers. The boxes are great, but they provide ready access for bugs, moisture, and anything else that would like to crawl in there. Also, varying temperatures will make pasta and rice go bad much faster. The secret to protecting your stockpile is to know which foods freeze well and which ones don’t. For the most part, no food is ruined by the process of freezing, at least nutritionally. Typically, it’s just the texture that’s damaged. It’s another story if the container is damaged, such as it is when canned foods burst. The best thing you can do for your stockpile is to keep everything in airtight containers if it’s going to be exposed to temperatures that are going to be below freezing. If you’re planning to use nature to keep your meets and other perishables frozen, store them in airtight containers too, so that animals can’t get into them. You have to make smart choices about your storage so your foods would freeze well, and you would safely preserve your food supply!